This hearty, mexican-style chicken soup is full of beans, veggies, and a satisfying kick of spice and lime. And it’s one of my new favorite soups! I really am in love with soups lately. Soups of all kinds really. Soups, stews, chili… all cozy, easy, one-pot meals! Unfortunately I think my family is getting sick of them and I was specifically asked not to make anymore soups for a while. This soup was absolutely worth the rule-breaking though… almost like a tortilla soup from your favorite mexican restaurat, only easier and heartier! There is just nothing like a good hot bowl of soup on a cold winter’s day. Heat the butter in a large dutch oven over medium high heat until hot. Dump in the onions, carrots and celery and sauté until soft and starting to brown, seasoning with the seasoning salt (Johnny's) while you stir. Stir in the garlic and sauté for a few seconds until very fragrant. Stir in the rest of the ingredients except for the lime juice, bring to a boil, then reduce the heat to low, cover and simmer for 2 hours or longer. Take the chicken out of the soup, shred it with a fork and then return it to the pot. Squeeze in the fresh lime juice (lemon will work fine if that's all you have!) and taste for seasoning, adding more salt/pepper/spice if desired. 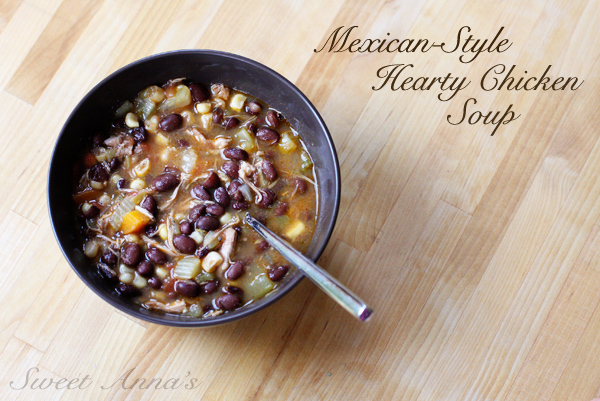 Serve with tortilla chips and diced avocados, if you want a Tortilla-Soup-style experience!